One area that fascinates me – perhaps more than any other – in my writing is the overlap between formal tailoring and more casual dress. If it is possible to retain the beautiful craft aspects of bespoke tailoring in casual clothing, as well as most of its aesthetic appeal, then it has far greater potential. I work in one of the most formal business environments in the world, surrounded by lawyers and barristers, yet even here a small minority of men wear a suit and tie. I want everybody else – for whom wearing a suit and tie would be seen as odd, not to say inappropriate, in their office – to get into bespoke and craft as well. The starting point should be softly structured jackets (likely Neapolitan); the second is probably better knitwear (fitted, and button-through to mimic a jacket); but third on the list, and definitely most excitingly, is leather. Readers will know that I had a bespoke leather jacket made by Davide Taub at Gieves & Hawkes two years ago. That was lovely, and included many aspects of bespoke (fit, proper shoulder). But it was essentially a casual garment; its roots were in biker and airforce jackets, not tailoring. This new project, with Parisian masters Cifonelli, is a different matter. We set out to make a suede jacket cut exactly like a tailored jacket. Perhaps a touch shorter, perhaps a touch looser (suede doesn’t stretch as much), but obviously a piece of tailoring. It’s easy to see a man wearing this just like he would a tweed jacket. With grey flannels, a blue button-down shirt and a navy merino crewneck. It wouldn’t be what he wore to a meeting (navy cashmere blazer and Dartmoor sweater, perhaps), but it would mark him out as one of the more senior members of staff. And the beauty of the piece would show both taste and status (let us not forget that formal clothing has always involved ‘codes’ implying social and professional status). 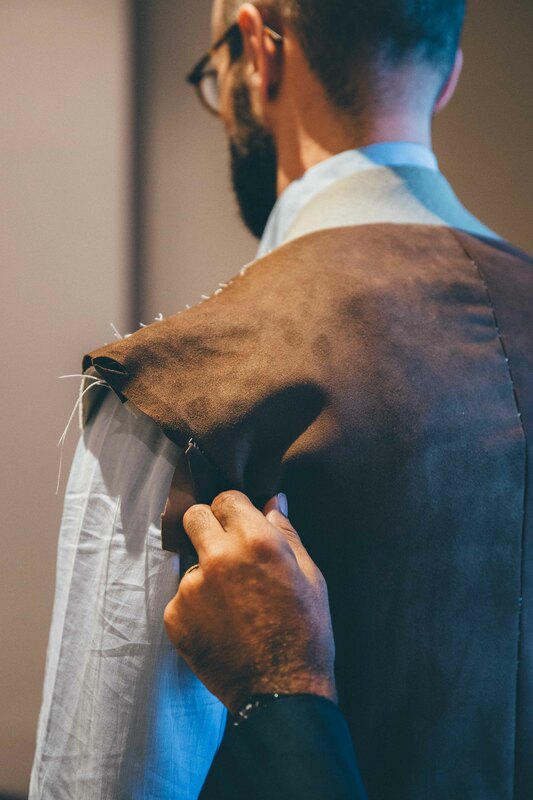 Now, very few tailors in the world can make a bespoke suede jacket. Even Davide at Gieves was only able to do so because he personally knew a leather outworker from his Maurice Sedwell days. French tailors such as Cifonelli, Smalto and Camps de Luca are different. They regularly make in leather – or at least often enough to have in-house tailors that the cutters can turn to for leather work. 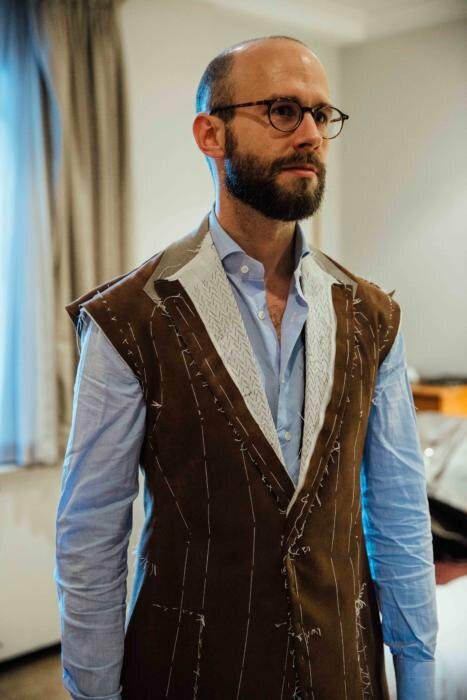 This jacket will have two buttons, two patch pockets and a shirt-shoulder (the Neapolitan way of making a jacket with the sleeve running underneath the shoulder, rather than folded on top of it). Incidentally, the shirt-shoulder is one more thing Lorenzo Cifonelli (above) has taken on and mastered in recent years. He now has tailors who also specialise in this construction method – alongside those for leather, DBs, overcoats etc. The make is exactly the same as a suit jacket, with shoulder padding, a hand-padded chest and lining. Seeing the normal Cifonelli hand work on butter-soft suede is a thing of beauty – I’ll do a separate post on that next week. You can follow the discussion on Cifonelli bespoke suede jacket by entering your email address in the box below. You will then receive an email every time a new comment is added. These will also contain a link to a page where you can stop the alerts, and remove all of your related data from the site. I am surprised at all the stitching through the front of the suede, I know this is the norm on fabric but would have thought the holes would remain when the stitches are removed on suede. Sounds a nice idea though for the jacket. BTW what is a Dartmoor sweater? Googling only appears to show up your own polo shirts or a brand of jumper. Yes lots of people ask that. No, it doesn’t leave holes. The Dartmoor was a sweater I designed with John Smedley. It is currently sold out. Oh my god, this is absolutly something I need. I love my neapolitan-made sportcoats, but I hate to take them off before I sit in my 911 to prevent them from wrinkling. Johnny , You should ask your tailor to make you a jacket from Escorial fabric. You will find it will wrinkle a lot less and any wrinkles will drop out in few minutes. This is because Escorial wool fibres are like coiled springs and the fibres have a memory. Interested to see how this looks when completed, including what (if any) accessories work with it (e.g. pocket squares). I imagine it could be quite a warm jacket (not being as breathable as conventional materials)? Sounds like a great project! 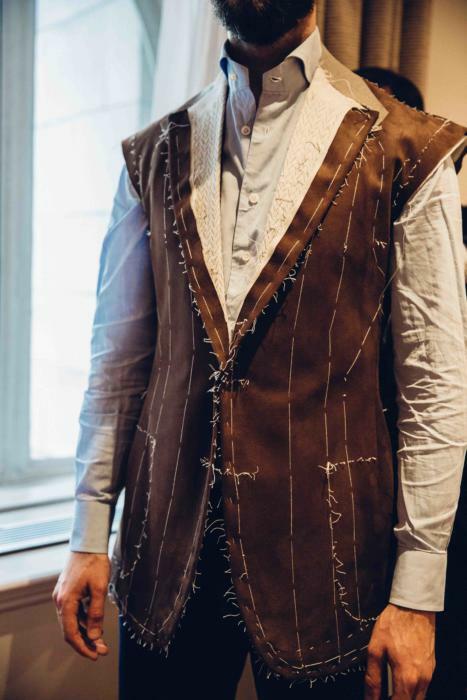 Will be very interested to see the finished article – would never really have considered a suede jacket cut this way but (as you say) could be a very nice bridge between formal and casual. Never been a huge fan of the suede (and smooth leather) blazer style jackets but I anticipate is to be very different. A bit like the Jeremy clarkson comments of the jacket and jeans post from the other week suede jackets always Spring ill fitting ones my teachers used to wear with baggy slacks. However I am sure a perfectly cut one by a master tailor may take that prejudice away. It’s quite funny how we build these clothing associations in our heads… Like cords always reminding people of their grandad this not wanting to wear them. The idea of a Cifonelli bespoke suede jacket is like Wagyu beef basted in fois gras. I would love to know some more details about the suede fabric used and the additional differences between construction using suede and that using more common suiting fabrics. For instance, how does Cifonelli aim to create a well-shaped shoulder without (I assume) the ability to shape the fabric by pressing? Will there be extra canvass used to achieve the lapel roll (assuming that’s even desirable in a piece like this)? Looking forward to followup posts. Hi Simon, this is a genuinely interesting project. You’re quite correct to note that even in what one would think of as traditional business environments around the city the suit is no longer omnipresent. So looking at, and understanding alternatives tailoring options is valuable. I am also interested in Ciffonelli as their imaginative and bold styling is certainly to be admired. 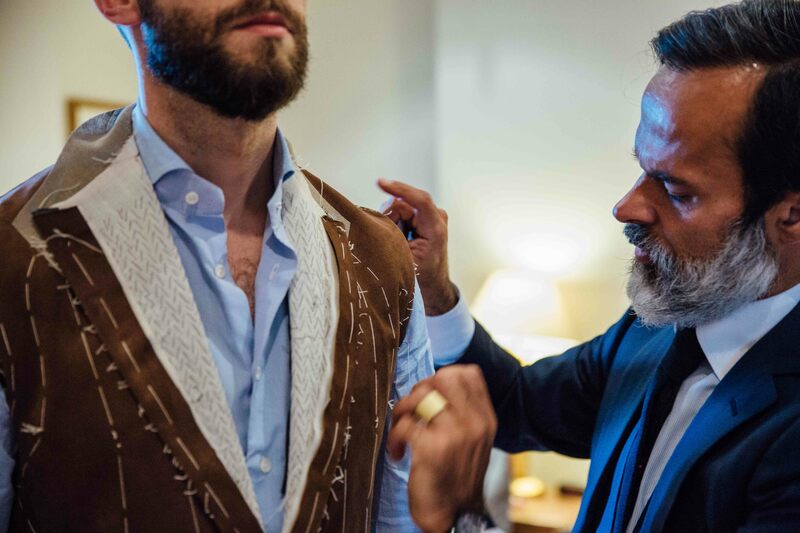 I am certain your jacket will be skilful executed and beautifully made, I would be keen to hear how it feels to wear it, the weight, fit, comfort indoors (if its to be worn in the office) etc. As always I look forward to following your progress with this latest commission. Keep up the excellent work. It reminds me to those leather waistcoats worn in the XVII-XIX century. I’m shocked by your statement that only a small minority of the barristers and lawyers in your vicinity wear a suit. I don’t want to potentially deal with a lawyer in jeans and football top! I wouldn’t have much faith in him. The watering down of dress codes at work has had an awful effect on people’s dress in general. There will always be a distinction between formal occasions and informal. Special vs everyday. There has always been a way of dressing to suit those different situations. Where will we end up? People turning up to a wedding in shorts and flip flops? A High Court judge giving his summing up in jeans and Metallica t-shirt? Those lawyers you mention are an embarrassment. Bring back strong dress codes in business. Sooner the better. It does read, ‘yet even here a small minority of men wear a suit and tie’. Is that a typo or have I misunderstood you, Simon? Whatever the case, thankfully there are still many smartly dressed men in suits around Mayfair and St James’s in particular and, yes, even the City. I said suit and tie, rather than just suit. And everyone in the area, of whom most are not lawyers. Anyway, still a shame! Thanks for fighting the good fight Simon! Ten years ago I would say the majority of lawyers in London wore suits all of the time at work. Even possibly five years ago most wore ties. That is no longer true. I work in and around Lincolns Inn and the Temple. Just an aside on the scarcity of suits and ties. One profession in which suits and ties are very much alive is teaching. The rural academy where I work sometimes feels like a metropolitan business district, with all the sharp suits and ties milling around. That’s not the say that they are all nice, but it is at least possible to wear a tie and not feel out of place. Few of topic questions regarding your latest book. I managed to read it and I really like it. It really offers great information about craft. One of the interesting things was the saddle stitch in Dunhill section. After the reading I went to see some videos and also read some articles about lockstiching. I also checked some existing designer belts and bags i own and I was surprised that some stitches look like saddle stitch (they are angled not straight). Is it possible to do machine stitching that has an angle? Is it even possible to recognize saddle stitching just by looking? The other question is regarding stitching on belts. Is the stitching there purely decorative in “non buckle area” (I guess most belts are single piece leather)? And you also mentioned high armhole and wide sleeves in suit and shirts section: doesn’t high armhole also mean narrower sleeves? – It can be hard to spot a saddle stitch. I doubt many of the things you have looked at are. A tiny minority of leather goods use it. – Most belts are made of two strips of leather, with a lining in between. So no, the stitching is functional. 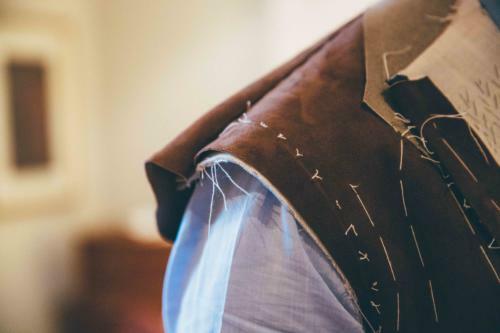 – A sleeve is pretty much always bigger than an armhole – the excess has to be worked in by hand, in the same way a sleeve is worked into a cuff. I actually don’t really understand the no tie with a suit. Separates yes.. Jeans and jacket yes…. but not a formal, plain business suit. I know so many men that do it and take actual pride in the fact they “don’t have to” wear a tie for work. I work somewhere with that rule and when I visit other offices I get the response, you know we don’t have to wear ties? Or how comes your so formal? Absolutely. And it means they all look identical. This is a very interesting project. I’m looking forward to reading your post on the end result. Interesting to see your suggestion of a merino crewneck with a tweed jacket and no tie. For this sort of casual outfit, how would you choose between crewneck, v-neck and cardigan? When would you go for each of those? Good question. One for a separate post perhaps. That would be great. Will look forward to it. There are so many challenging materials on the Bespoke market. The addition of one more doesn’t seem worthwhile. Many materials fit more appropriately into the made to order silo . It occurs to me that this is one of them. I look forward to seeing the finished article Simon – I hope you are not disappointed. I know what you mean, but there is obviously something that bespoke adds to the fit and structure, in any material. The piece was actually finished, and you can see the piece here. Interesting perhaps also to compare it to something more made to measure, eg this leather I had made.